Bursa Ulu Camii located at the first capital of the Ottoman Empire. The mihrab of Bursa Ulu Camii in the above. 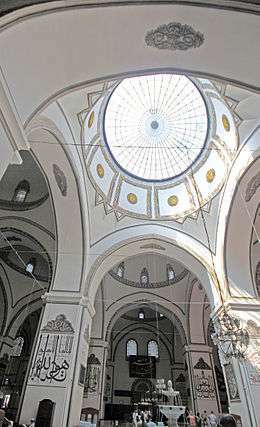 Şadırvan (Interior ablution area) in the above and its Dome in the image below. It was built by Ottoman Sultan Bayezid I, in between 1396-1400. It is located in the city center of Bursa. 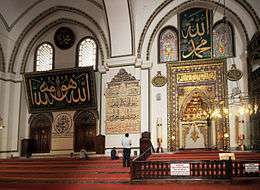 Ulu means in Turkish "the greatest" and it is the greatest, the biggest mosque in Bursa. 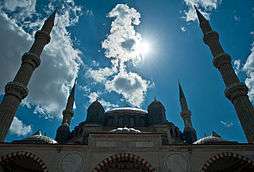 Islam in the Ottoman Empire; Islam was the official religion of the Ottoman Empire and became more important after two seminal events: the conquest of Constantinople and the conquest of Arab regions of the Middle East. The highest position in Islam, caliphate, was claimed by the sultan, after the defeat of the Mamluks which was established as Ottoman Caliphate. The Sultan was to be a devout Muslim and was given the literal authority of the Caliph. Additionally, Sunni clerics had tremendous influence over government and their authority was central to the regulation of the economy. Despite all this, the Sultan also had a right to decree, enforcing a code called Kanun (law) in Turkish. Additionally, there was a supreme clerical position called the Sheykhulislam ("Sheykh of Islam" in Arabic). Minorities, particularly Christians and Jews but also some others, were mandated to pay the jizya, the poll tax as mandated by traditional Islam. Ottoman law did not recognize notions such as ethnicity or citizenship; thus, a Muslim of any ethnic background enjoyed precisely the same rights and privileges under "Muslim millet". It was claimed that under such conditions, Muslim Arabs came to view the empire as a revived Islamic empire. However, even if Caliphate played a significant role, the real existence of these feelings is questionable. By the 17th century, the Maghreb regencies were only nominally under Ottoman control and Egypt was almost independent by the beginning of the 19th century. In the late 18th century and especially during the 19th, European-style reforms pushed Islam out of influential positions and diminished its leaders' influence in government. The jizya was abolished and the exclusive power of Islam's leaders dwindled. 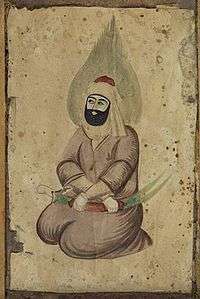 Despite this, the government under the reforming Sultans still sought to reinforce Hanafi Islam where it was seen as under threat in the empire. Parallel to reforms came Ottomanism, a concept that sought to integrate all Ottoman citizens into one social class (Muslim and non-Muslim) with equal tax and military responsibilities. As a result, religious minorities (who may not have even received full rights under pre-reform Ottoman rule) rebelled. Some see that Islam, as practiced in the Ottoman Empire was superstitious in many ways. Since the founding of the Ottoman Empire, the Ottomans followed the Maturidi creed (school of Islamic theology) and the Hanafi madhab (school of Islamic jurisprudence). However, it was the Ash'ari creed that was more prevalent in the madrassahs (Islamic schools). Both the Maturidi and Ash'ari schools of Islamic theology used Ilm al-Kalam (reason) to understand the Quran and the hadith (sayings and actions of Mohammed and the Rashidun) so as to apply Islamic principles to fatwas (Islamic rulings). This is in contrast to the Athari (or literal) school of Islamic theology which takes the Quran and the hadith literally. Kemal Ataturk stated: "Our religion is a rational, plausible religion, which is why it is the last valid religion. Ottomans often wore little charms, such as necklaces, to protect themselves from evil. The greatest of these evils, to which most of these charm was the Evil Eye. The Evil Eye was no specific evil, but was most often attributed as jealousy. The tomb of Hurufi-Bektashi Dervish Gül Baba in Budapest, Hungary. Because of their heterodox beliefs and practices, Alevis have been the target of historical and recent oppression. They sided with the Persian Empire against the Ottoman Empire and forty thousand Alevis were killed in 1514 by Ottomans. The Qizilbash of Anatolia found themselves on the "wrong" side of the Ottoman-Safavid border after the 1555 Peace of Amasya. They become subjects of an Ottoman court which viewed them with suspicion. In that troubled period under Suleiman the Magnificent the Alevi people were persecuted and murdered. Lewis, Raphaela (1971). Everyday Life in Ottoman Turkey. Dorset Press. p. 208.